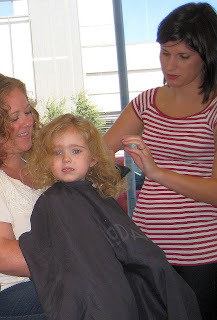 Jaedeanne and Baby Ruby: Ruby's First Haircut! I've been reading a lot about the best products to use on her hair, the best tips and tricks to keep her hair looking amazing with her ringlets and not like she just stuck her finger in a light socket (speaking from experience, this is a very, very fine line). 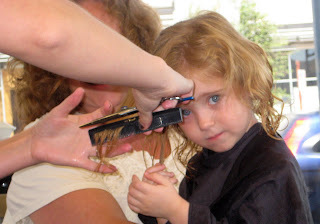 A recurring theme was that every mom said that they swore by regular haircuts. 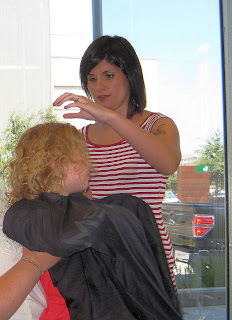 Not just a quick chop from one of the kid cut places on the corner, but they specifically recommended Aveda stylists that specialized in curly hair. 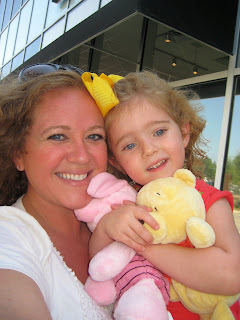 Well, Ruby hit the jackpot by having me as a mom. I was able to kill two birds with one stone, so to speak, because I also use an Aveda stylist that specializes in curly hair. So we went in last Friday for our appointments. 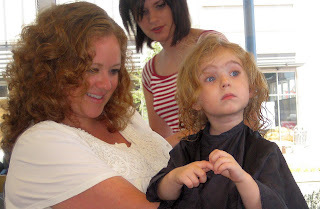 I got my hair cut first, while Nana and Ruby toured the salon and surrounding shops in the West 7th area. When it was Ruby's turn, she was none too pleased. "NOOOOOO MOMMY! IT'S GOING TO HURT!!!!!! PWEEEESE NO!!!!" Lauren, the stylist, was incredibly great with her and showed her with one quick snip that there wasn't any pain associated with it. "See - did that hurt?" "Hmmmm........nope!" With that, we were off and running with her haircut. She just got a quick trim to even out her ends (we haven't even remotely begun thinking about the concept of layers at this point - her hair is naturally layered pretty well right now). She was all smiles after she was finished and made a point to turn in circles for everyone to see her new 'do. She's asked me a few times since then when her next haircut will be. What a beautiful little girl! Love you lots Ruuuuu-beeee!